Purveyors of musical goodness 4our’s is one of Sydney most respected and much loved House and Techno nights and this Friday night they celebrate two years of cracking parties. The resident DJs are reunited once more for their 2nd birthday and yep they have decided to throw a large one for the people. 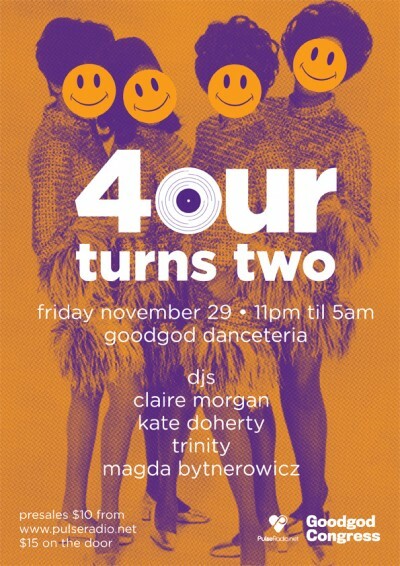 Claire Morgan returns from Berlin for an Australian summer blitzkrieg tour, and she kicks it all off with her homegirls Trinity, Magda Bytnerowicz and Kate Doherty this Saturday on November 29 at in the Danceteria. There will be birthday presents galore for early birds so make sure you get down quick smart and raise a glass with us. The Rane rotary will be installed to assist us in bringing future funk for all hours from the decks to your feet.